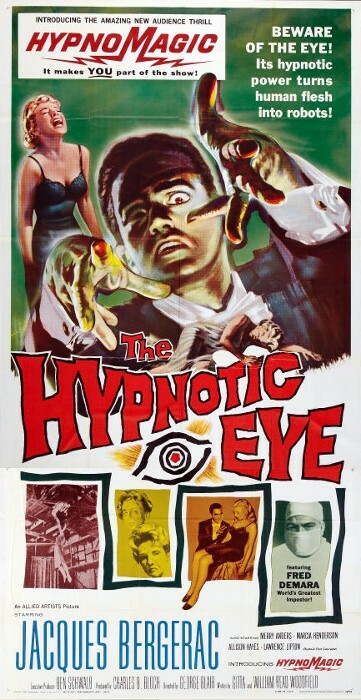 poster campaign for The Hypnotic Eye. This entry was posted on June 19, 2011 at 4:33 am and is filed under 1960-1969 with tags Allied Artists, Allison Hayes, Ben Schwalb, Bloch/Woodfield Productions, Charles B. Bloch, Crime, Film Noir, George Blair, Gimmicks and Promotions, Guy Prescott, Jacques Bergerac, Joe Patridge, Marcia Henderson, Merry Anders, Mystery, Revenge, The Hypnotic Eye. You can follow any responses to this entry through the RSS 2.0 feed. You can leave a response, or trackback from your own site. This site was mentioned on Twitter this week….